“Life and business are all about seizing the moments or opportunities. So that’s what I’m doing,” says Marvin Agustin. 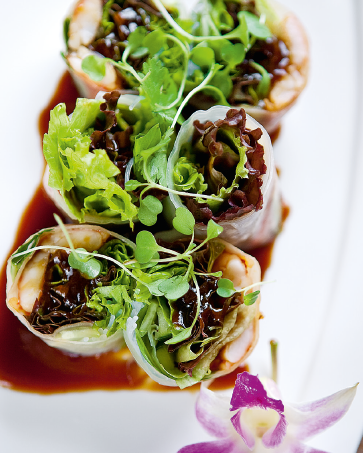 This gutsy spirit might account for why the well-known actor has made a name for himself in the restaurant scene as well. From Oyster Boy, his first venture into the restaurant business, Agustin now has several establishments under his belt: Sumo Sam, Marciano’s, John and Yoko, Mr. Kurosawa, Johnny Chow, Komrad, and Roboto San Japanese Grill Buffet. How did this showbiz personality make the transition to serial restaurateur? Agustin, who is in his thirties, credits Ricky Laudico and Raymund Magdaluyo, his good friends and business partners, for much of his success. Magdaluyo is a successful restaurateur in his own right, as he is the brains behind dining places such as Red Crab, Claw Daddy, and Crustasia—all of them specializing in seafood. Laudico, who is a chef, co-owns Floring’s BBQ and Grill and Crisostomo with fellow chef Florabel Co Yatco. The trio opened the first branch of Sumo Sam, which serves Japanese dishes with a Western twist, at Shangri-La Mall in Mandaluyong City in December 2005. 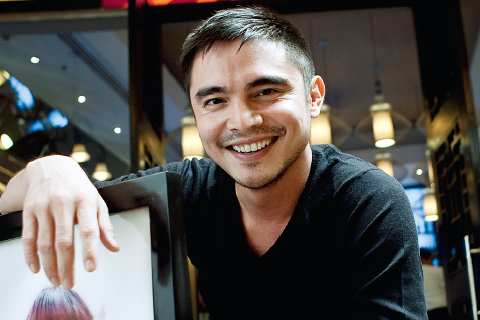 The resto, which Agustin considers ‘his baby,’ has since expanded to several branches across the metro, plus one each in Cebu and Davao. Another strategy they use is customizing a concept. “We conceptualize and build a restaurant fit for a certain location or property developer. 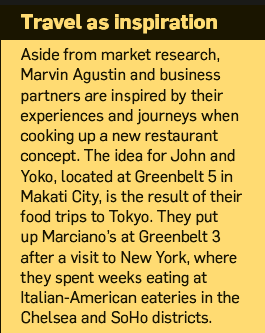 We have a specific restaurant theme for Greenbelt or the Ayalas, for Eastwood or Megaworld Properties, or for Shangri-La,” Agustin says. Actually, it could be said that the food business was part of his life, even before showbiz. Agustin applied as a waiter at Tia Maria’s in Alabang, Muntinlupa, but was not accepted because he was only 16 then. Undeterred, he got some training in bartending and convinced the Mexican restobar’s management that he was qualified for the job. As a celebrity, one of his first endorsement projects was with Mister Donut. As part of his deal, he got a franchise of the donut chain. This outlet, which was located in Makati City, was doing brisk business until convenience stores also started selling donuts, eating into his earnings. Eventually, Agustin had no choice but to close it. “My previous experiences, from waiting tables to bartending, serve me well until now. I know the ins and outs of the food business. I can say that I have come full circle in this business and I have paid my dues,” he shares with a smile.